Nike's marketing pitch: Lightweight stability. Smooth transitions. Midsole: Dual-density compression molded EVA foam, forefoot Zoom Air. 10 mm heel offset. Widths available: B - narrow, D - regular (reviewed), 2E - wide, 4E - extra wide in select colors. The Structure 20 goes back to the basics, and that's a good thing. Improved ride and better upper fit over the 19. There used to be a time when a medial post based running shoe had design merit, but those days are long gone. You can read the long-form opinion piece here, but in short, footwear meant for ‘controlling pronation’ are products which try to solve a problem which doesn’t need solving. There are many neutral shoes which are supportive enough, and there’s no need to keep marketing an ancient product category. Some brands have realized this and are attempting to evolve the category, as seen in the examples here and here. When one goes after a problem which doesn’t need solving, mediocre shoes such as the Nike Structure 17 and 19 happen. Now look, there is nothing wrong with moderate ‘support’ or ‘stability’ shoes. Many of them have a firm and balanced ride, and will continue to work as a daily workhorse for many runners. The trouble begins when you overthink the category just for the sake of newness. This is very much a Nike problem, a brand whose stock price depends on (among other things) how many ‘new’ things it brings to retail each year. For example, both the Structure 17 and 19 were marketed as ‘stability’ shoes, but they were anything but. The Structure 17 had an overly soft lateral midsole which had the foot leaning outwards. We were pleased when the much firmer Structure 18 rectified the problem experienced on the 17. But then the 19 showed up, and it made the same mistake which the 17 did. The Structure 19 stacked together hard and soft wedges in a way that actually made the shoe unstable. 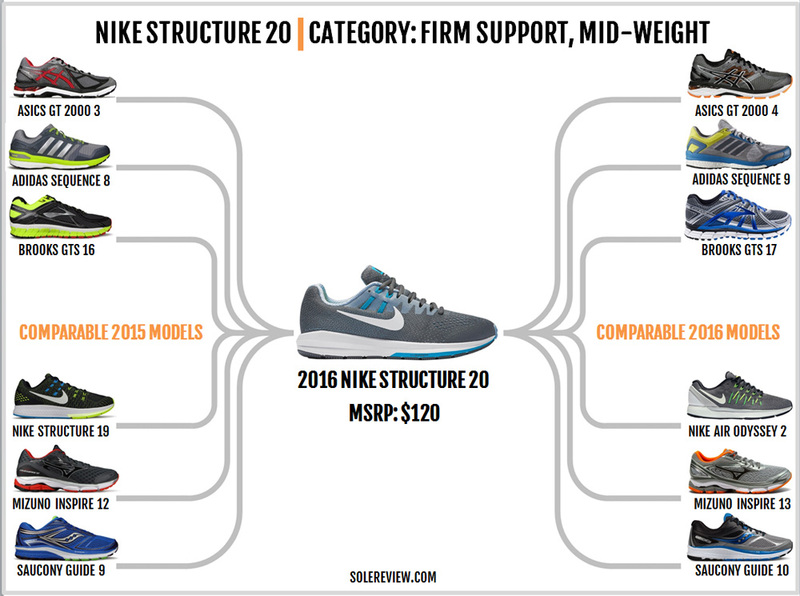 From a stability perspective, the Structure 20 is an improvement over the 19. The midsole design has been overhauled to deliver a much better balance of firm and soft, and as a result, there’s none of the 19’s eccentric midsole behavior. The upper loses a lot of the Flywire looping, which is great news too. Solereview has been very vocal in its dislike of the cord-based lacing design. Here’s the catch, though. The fact the Structure 20 is a vastly improved Structure is no guarantee of the future that follows. The Structure 21 could be better or worse, depending on who holds sway over the design direction. But for now, take comfort in the knowledge that the Structure 20 addresses a lot of the S-19’s shortcomings. 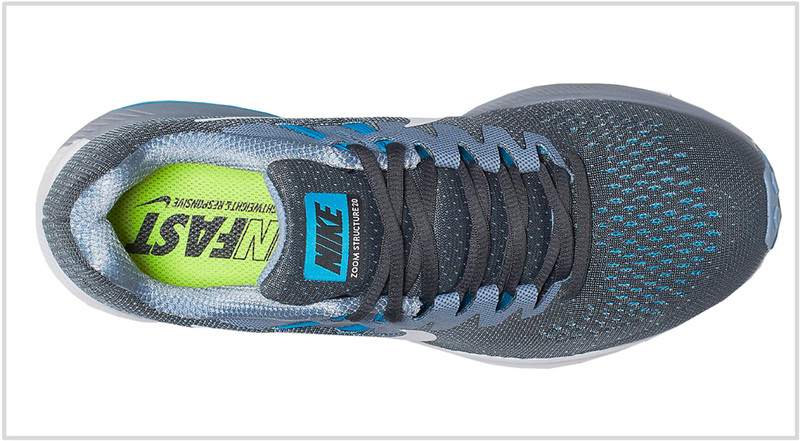 The new midsole has an improved ride, and the upper fits better too. 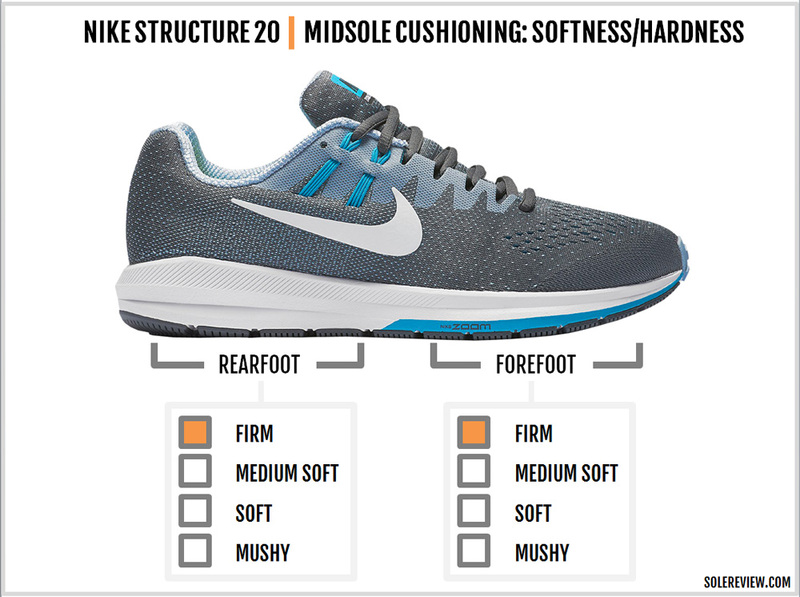 For runners new to the Nike Structure, it helps to be aware of the shoe’s purpose-built design. The Structure is a shoe with a medial post and a firm ride; it isn’t a product meant for all day comfort. There are better alternatives if you’re after a cushioned daily trainer, so do read our other reviews for alternatives. Being a medial-posted shoe, it is one of the many fish in a big pond. There’s a variety of similarly designed shoes to choose from. 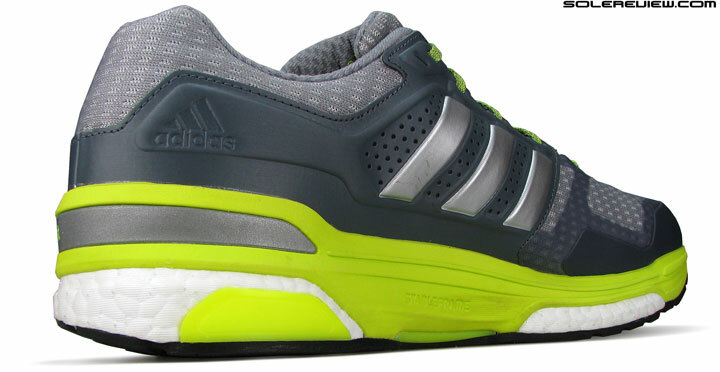 There are some old timers such as the Asics’ GT 2000 and the Brooks GTS Adrenaline 17.
adidas recently replaced its medial posted shoes with ‘Stableframe’ based products; the Sequence 9 is a case in point. The Everun topped Saucony Guide 10 is another shoe which does an excellent job of melding different design elements. Mizuno has always been an outlier in this category, but the Inspire 13 continues to be a sensible choice for runners who want both cushioning and support. Along with the Adrenaline 17, the Brooks Ravenna 7 is also worth a look. 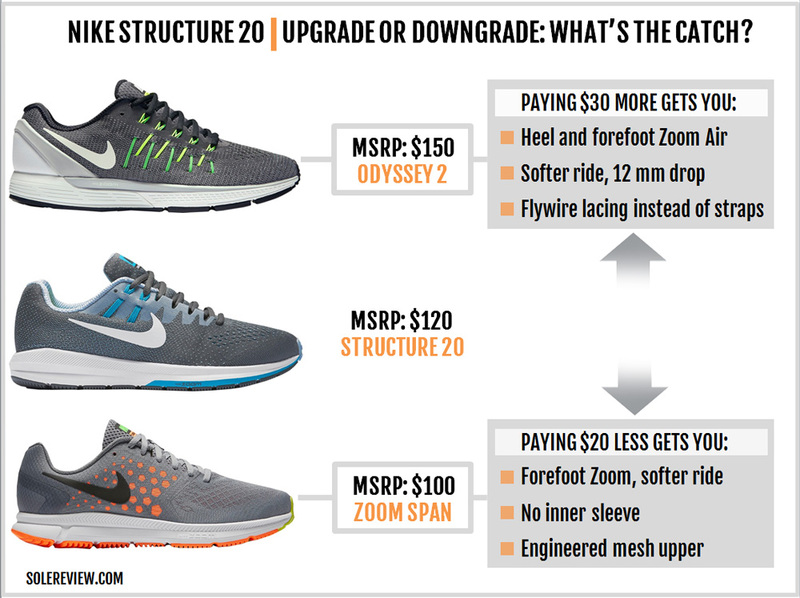 Within Nike, the Zoom Odyssey is the Structure 20’s upgrade path. We’ll cover Odyssey during the ‘upgrade/downgrade’ section towards the end of this review. And for those of you who are looking for a touch more warmth and water resistance, the ‘Shield’ version of the Structure is also available. Based on outward appearances, the Structure 20 has a lot in common with the 19. The upper is based on the single-piece, Flymesh design template which was first introduced on the Structure 18. 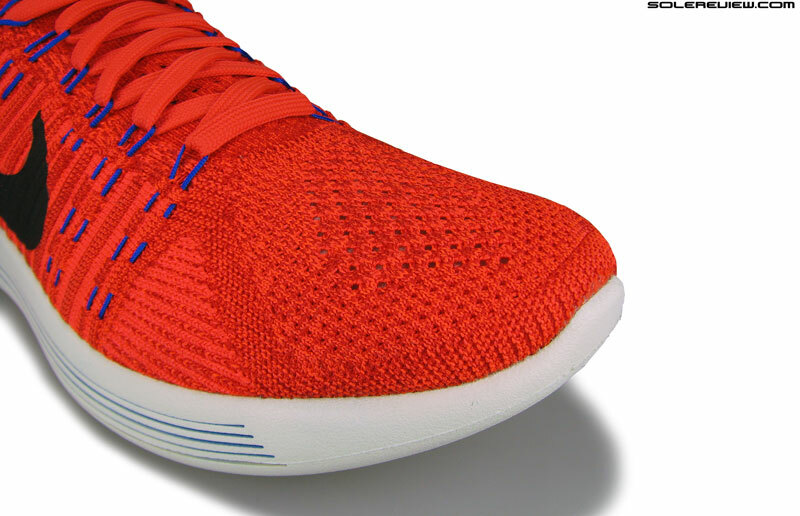 The Flymesh is essentially engineered mesh, but drips heavy with Flyknit aesthetic. 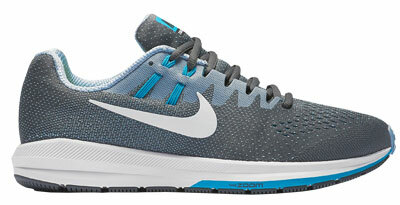 This look is now commonplace on most Nike shoes, be it the Pegasus, Vomero, or the Odyssey. The Flymesh is a two sided deal; while the shoe ends up looking somewhat bland, the elimination of external layers creates a smoother interior. Both the S-19 and S-20 look similar, except that the 2016 Structure 20 comes with a lot of functional updates. The biggest one is the introduction of inner straps which Nike calls the dynamic fit. Jog your memory, and you’ll recollect that this inner strap based lacing has been used before. Notable examples would be the 2013 Nike Structure 17, the 2012 Nike Free Run 3, and the 2013 Vomero 8. This means that except for the last two rows, Nike’s less-than-perfect Flywire cords are history – for now. The first four lacing rows are now hooked to inner lacing straps. The upper turns inside, forming a sturdy loop for the laces to pass through. It must be mentioned that the inner sleeve is still present in the S-20, forming a sock-like fit. The inner straps are situated in the space between the sleeve and outer upper, which makes the 20’s midfoot a warmer place than the 19. To strengthen the speed-loops, the S-20 adds fused layers on both sides of the midfoot. 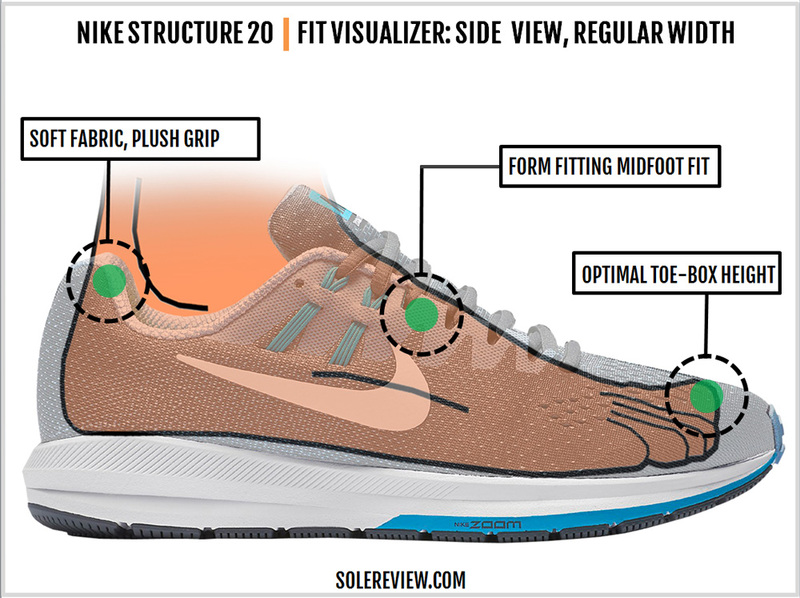 In lieu, the Structure 20 removes the transparent laminate over the forefoot. What’s interesting about the 20 is its treatment of lacing distribution. All the past three Structure models – 17, 18 and 19 – had lacing biased towards the medial (arch) side. The Structure 17 had dynamic fit lacing only on the medial side, and the 18 had five rows of Flywire on the medial versus three on the lateral side. Even the Structure 19 had five flat loops on the medial upper, but only three on the outer side. 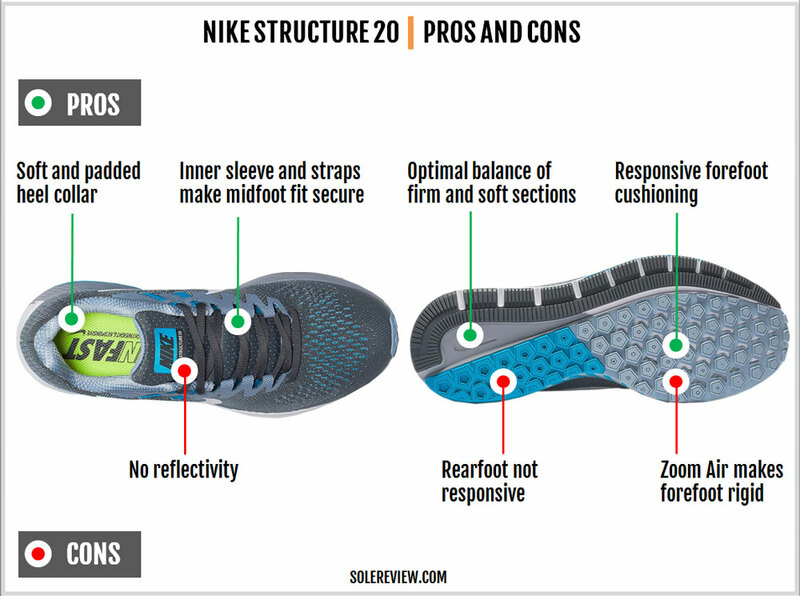 The S-20’s lacing is equally distributed, meaning that both the medial and lateral sides get the inner loops. There’s no disparity in the Flywire cords either, as both sides get the flat straps. Take a look at the picture above to see what we mean. The tongue padding isn’t as generous as the Vomero 11, but isn’t pancake flat like the Structure 18 either. In other words, it’s the same as the 19. For long, the heel collar used a fabric lining common to many models. The Structure makes the switch to a different textured mesh while retaining the soft hand feel. For good measure, there’s more foam packed in the heel than the 19. The Structure has a strange tradition of omitting reflective trims, and the 20 lacks low-light visibility too. Maybe Nike is trying to make a case for the Structure Shield up-sell. The core of the Nike Structure (or for that matter, any medial posted shoe) is its midsole, and that’s where the 2016 version markedly differs from the 19. If you remember, both the Structure 18 and 19 had a triple density midsole. Besides the usual stack of firm and softer foam, there was a hard, bridge-like component on the medial side. The Structure 20 eschews the use of the bridge component, and the midsole evolves into a conventional design. 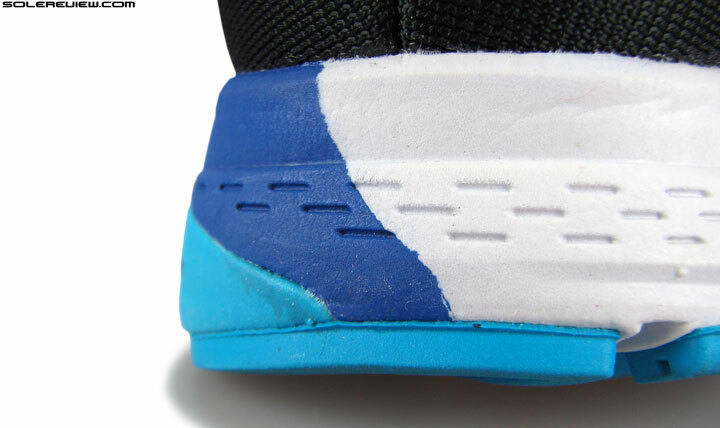 The firmer medial post is now highlighted by blue midsole paint over the foam. This also means that the 20 also gets rid of the high under-arch curve on the medial side. 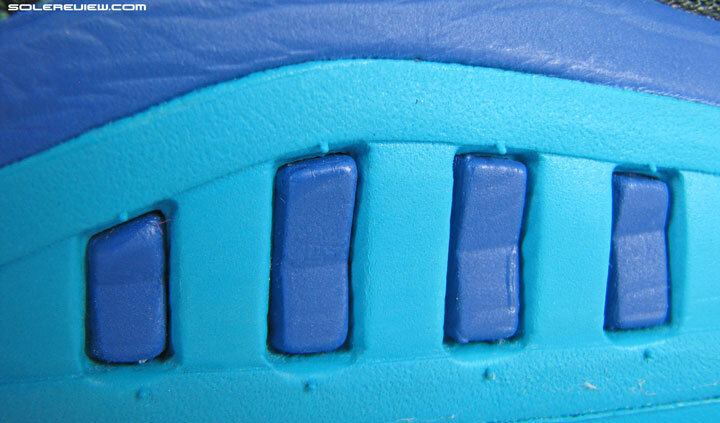 One of the Structure 19’s issues had to do with how the firm and soft parts of the midsole were stacked together. The harder section met the softer foam almost near the heel centerline, which led to the S-19’s behavioral issues. More precisely, the foot felt as if it were hanging to one side on the S-19. The Structure’s medial post placement is far more subdued. The revised stacking arrangement limits the medial post to the inner side, like how most shoes in this category are designed. There are a few more important updates. The S-19 had a groove running down the length of the lateral midsole, separating the upper and lower sections. On the 20, the groove is still there but split into two. There’s a groove which runs from the forefoot to the midfoot, and there’s another which is located in the lower part of the rearfoot. The new midsole also gets an increased base, as the foam flares out wider than the 19 did. 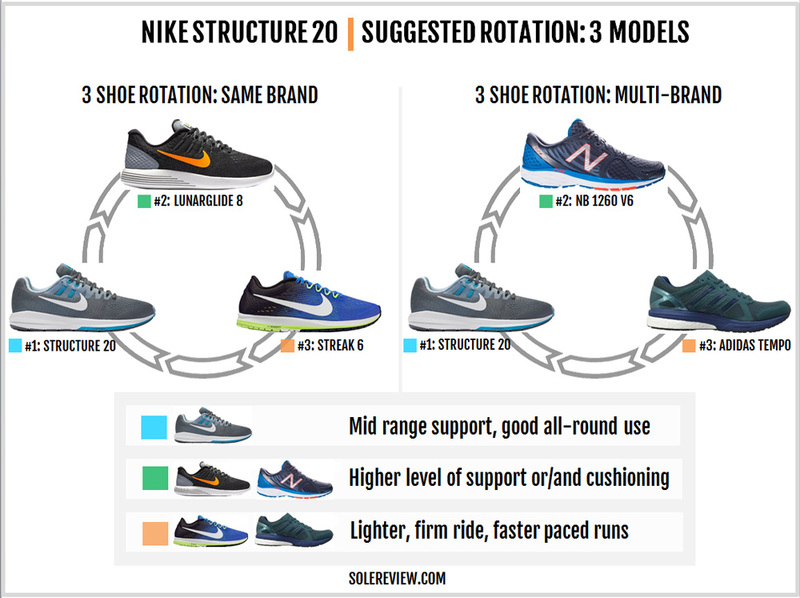 While the general layout of the Structure 20 is similar to the 19 – there’s the familiar ‘crash rail,’ and a transition groove which runs through the length of the outsole. That said, there are a lot of changes. For starters, the ‘crash rail’ design is inspired more by the Structure 17 than the 19. There’s a higher number of flex grooves splitting it up, and the lugs have a rib-like structure. 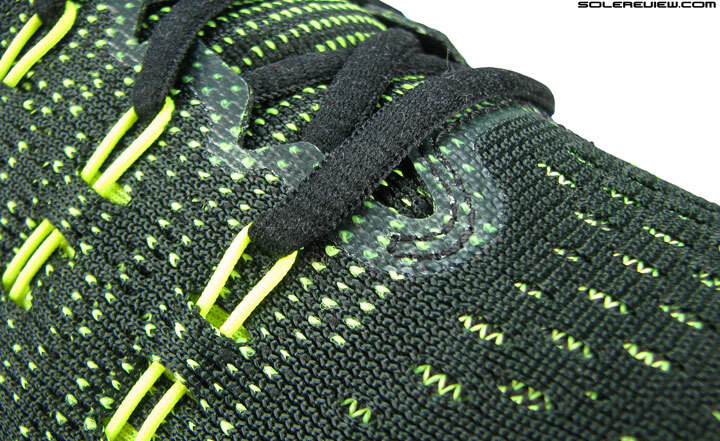 If the crash rail gets more grooves, the other side of the outsole rations it. 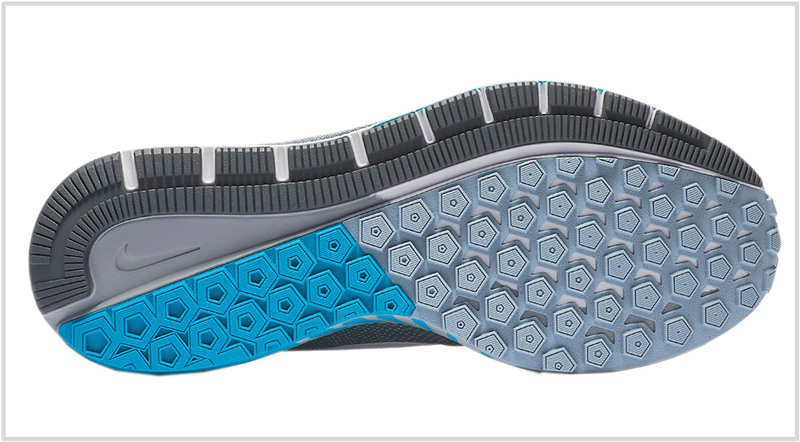 The entire inner outsole is free of flex grooves and evolves into a full-contact design. The inner outsole is wider, which decreases the area of exposed foam under the heel. Under the heel edge, the Structure 20 moves the crash pad groove to the inner side of the midsole. This is completely different from the Structure 18 and 19 where the groove was on the outer side. A good way to sum up the Structure 20 is that the new design dials down on the over-engineering. In doing so, the shoe goes back to the basics, which ends up being a good thing. 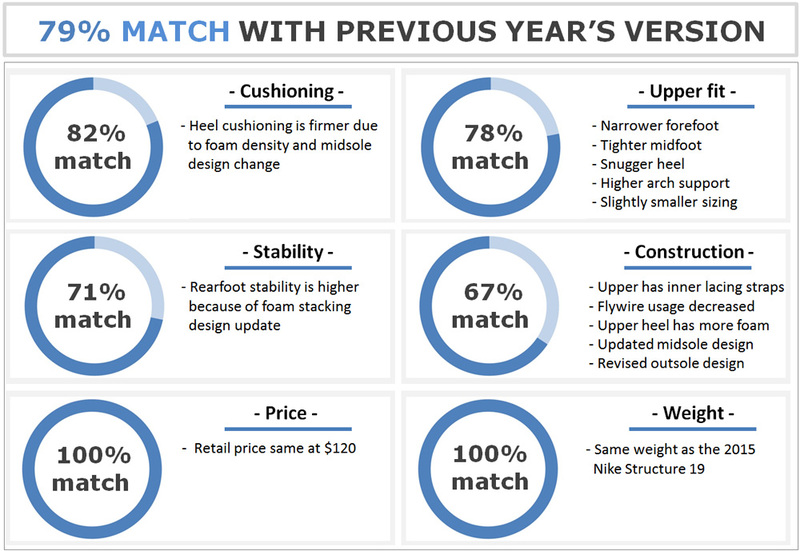 The Structure gets increased outsole rubber coverage this year. Not that the previous Structure had any durability issues; if anything, the Structure 20’s larger rubber slabs should hold up better than the 19. The inner strap based lacing loops are super strong, so there’s little chance of them failing. 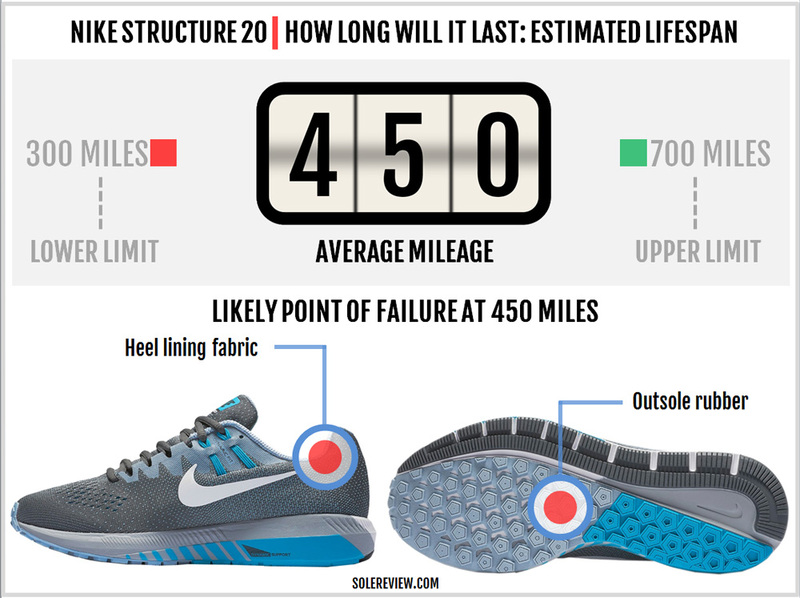 The estimated median mileage is 450 miles, with normal wear and tear happening on both the upper and outsole. Areas like the heel lining tend to wear out over time, and so does the outsole rubber – depending on what your foot-strike and loading pattern is. Of all the upper fit changes made on the Structure 20, the midfoot update is the most noticeable. The inner straps wrap around the foot uniformly without the localized cinching of the Structure 19’s Flywire cords. When combined with the inner sleeve, the evenly spread fit pressure of the Dynamic fit straps makes the interiors even smoother. Some runners might even describe the insides to be softer than the 19. The fact that both sides of the midfoot now have an identical lacing system also separates the Structure 20’s fit from the 18 and 19. Both sides of the midfoot fit identically, in contrast to the medially based lacing of the 18 and 19. 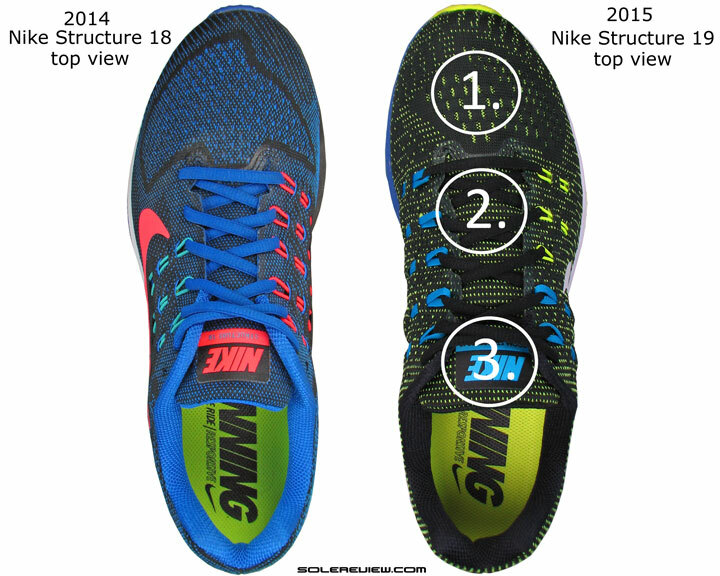 It’s important to note that the midfoot lacing design is more responsive to cinching pressure than Flywire. Whereas Flywire straps or cords applies pressure only near the top, the tried and tested inner straps respond by spreading fit pressure uniformly. It would be even nicer if the Structure had flat laces like the cheaper Air Zoom Span. But then, perhaps the reason Nike hasn’t resorted to doing so is the presence of Flywire cords. Even with the modified lacing system, the S-20 still has two rows of Flywire straps. Flywire probably lasts longer with round laces rather than flat ones. There’s little change in the toe-box height. The insides have the same internal toe-puff component as the 19, a feature which creates enough room on the top and the sides. The forefoot fit is a bit snugger than the 19, and that isn’t due to a change in the last. 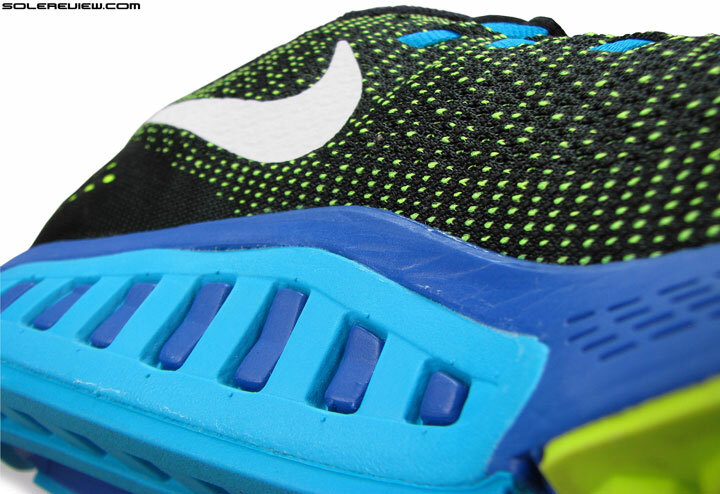 The upper heel is packed with more foam, and that pushes the foot slightly forward. This makes the Structure 20’s forefoot fit feel narrower than the 19. Not tight, though; the Structure 20’s fit is just right. And so that you know, the shoe is available in four widths – B, D, 2E, and 4E. 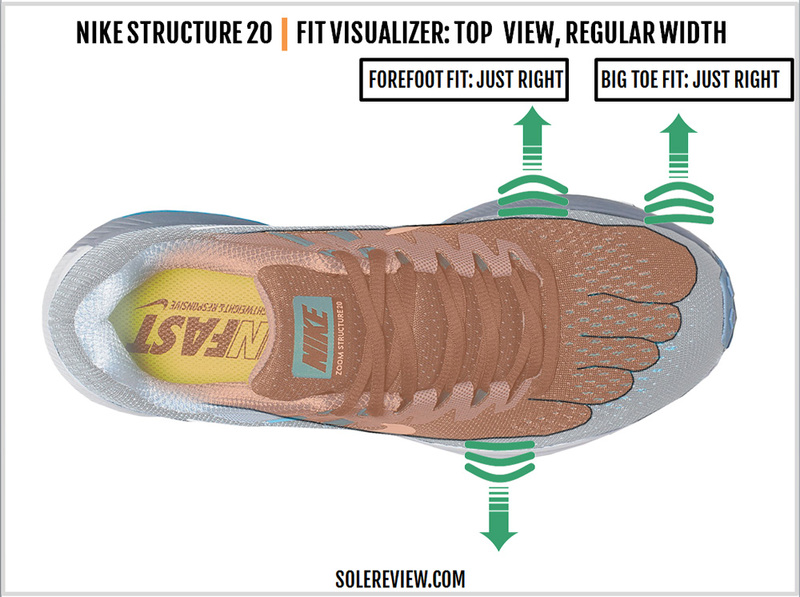 There’s no laminate layer over the forefoot anymore, so the Structure 20 feels softer during flexing compared to the 19. Like most shoes with a firm midsole, the removable sockliner produces most of the initial softness. 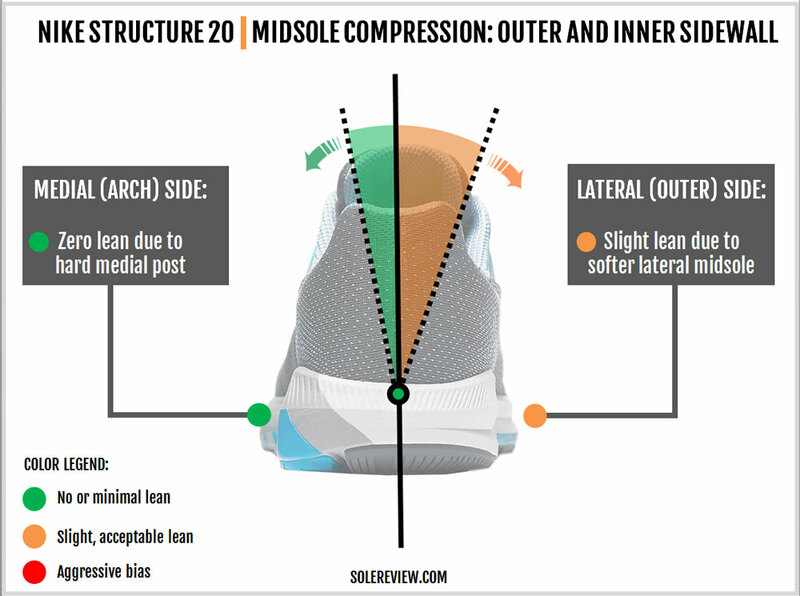 The Structure 20’s inner midsole (with the medial post) is super hard, and the lateral midsole is also firm. The Structure 20 also has a narrower area of exposed midsole foam underneath the heel, so that also contributes to the midsole’s firm ride. The Structure 20 runs firmer than the 19 for sure – both due to the midsole foam density and outsole design change. The Structure 20 comes with a Zoom Air bag inside the forefoot, whereas the rearfoot is multi-density foam. Naturally, the front is responsive while the rear is not. This makes the Structure more responsive for forefoot strikers than others, and even so, the responsiveness can be tapped into only at higher speeds. In its inert state, the drop-stitched Zoom Air bag is very firm. The firmness and softness are better balanced on the S-20 than the 19. 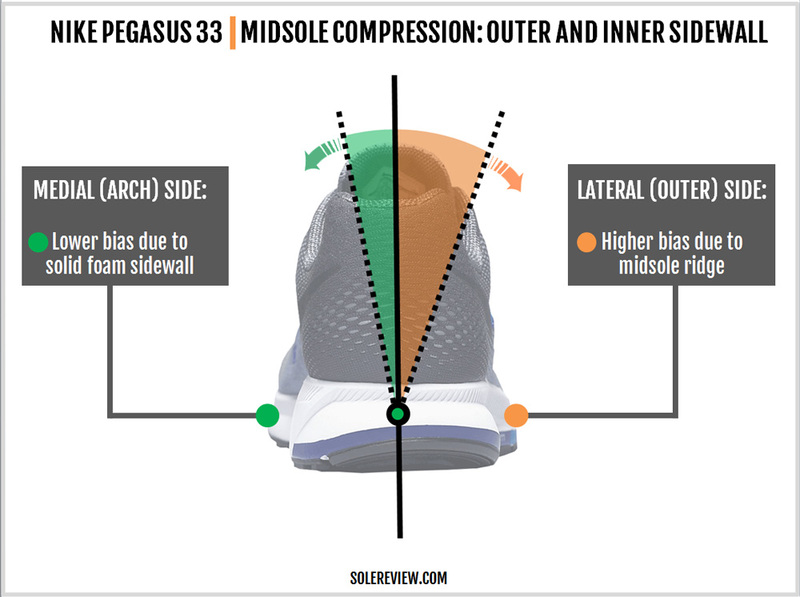 One of the reasons is that the wedge is limited to the medial side, and the outsole update does a better job of balancing midsole foam densities. So the nervous see-sawing character of the Structure 19 is a thing of the past. Replacing that is a mature ride quality – which is in line with how traditional motion-control shoes behave. There’s a slight lean laterally because of the difference in foam densities. This is expected behavior, true not only for other motion control shoes but neutral shoes as well. The Structure 20 is more supportive not only due to the restored balance of foam densities, but also because of a wider base. Some sections of the midsole and outsole span wider than the 19, and that helps produce a planted feel. We’d also like to call out the Structure 20’s redesigned medial midsole curve. Because of the S-19’s aggressive midsole posting, the under-arch area had a prominent curve. This feature was a bit uncomfortable, so the Structure 20’s update here is a welcome one. The reworked S-20 midsole produces better transitions than the 19, as the firm and soft midsole areas are better integrated with one another. 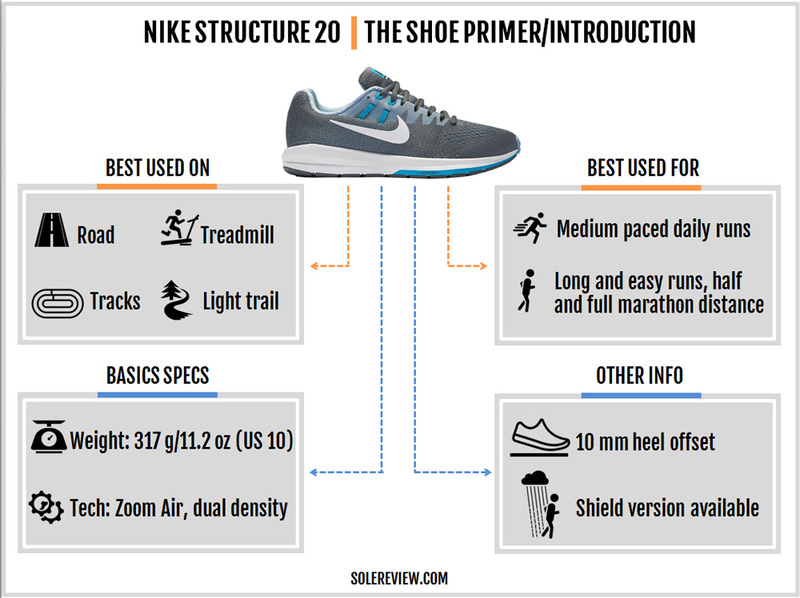 The good thing about the Structure 20 is that it behaves like a regular motion-control shoe. It has none of the aggressive lean experienced on the Structure 17 and 19. There’s a Zoom bag under the forefoot, so that’s positive news for responsiveness. On the flip side, the rearfoot feels flat and unresponsive. In a few ways, the Structure 20 has shades of the Zoom Elite 8 – another shoe with a firm ride and a responsive forefoot. The upper fit quality strives for balance too. The lacing on both sides is hooked up to the inner strap system (Dynamic fit), so the grip is even instead of one sided. The collar gets brand new upholstery with increased padding, so count that as an upside in the comfort department. The Nike Lunarglide 8 blends cushioning and a supportive ride quality in equal measure, which differentiates it from the firmer Structure 20. 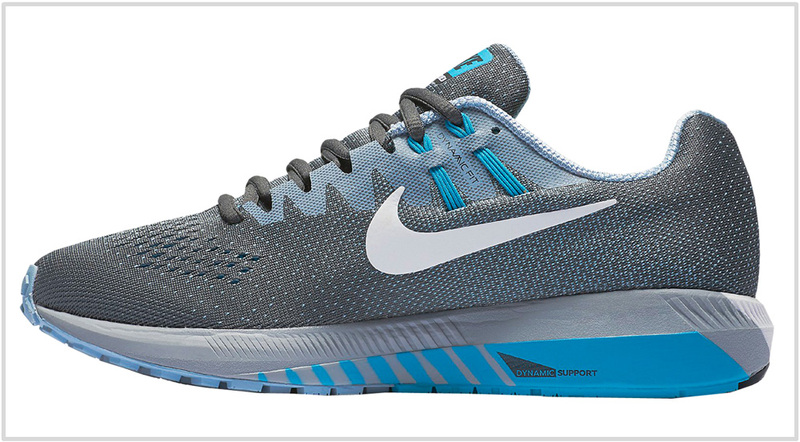 The Lunarglide does not have a medial post, so the shoe is more neutral, less motion-control. Unlike adidas, Asics, and New Balance who have their Tempo 8, DS Trainer 21 and 1500 V2 as medial-posted lightweights, Nike has no such shoe in this category. So you’ll have to manage with either the Streak 6 or the Lunartempo 2. Both shoes are classified as neutral but happen to be relatively supportive too. On the plusher side of motion-control, the New Balance 1260 V6 is a good alternative. We don’t recommend the Odyssey because the shoe is close to the Structure, and hence lacks the rotational value of the NB 1260 V6, or even the Saucony Hurricane ISO 2. The point of this long rant is that the updates are plentiful on the new Structure 20. The midfoot fits better and snugger; the ride is better balanced, and the outsole and the midsole benefit from a large number of design tweaks. The basics stay the same, such as the weight and retail price. For more details, have a look at the infographic above which compares the Structure 20 to the Structure 19. There’re couple of more Nike models with medial posting, one which is more expensive than the Structure, and another which is priced lower. Last year, Nike released the Zoom Odyssey – a dual Zoom Air bag fitted shoe with a really long medial post. The 2nd version of the triple-density foam Odyssey is already out in the market, selling for a princely $150. The Odyssey runs softer than the Structure, not only due to the extra Zoom Air bag, but because of the softer midsole and outsole rubber. There are a few more differences, like the higher 12 mm heel offset and an upper dependent on Flywire lacing loops. In a recent development, the Nike Air Zoom Span has sneaked back into the line. In the past, the Span was a pared-down version of the Structure, and that value proposition stays unchanged today. The medial-post is very small, so the ride behavior is almost neutral – just with a hint of medial side support. For $100, the Span offers a relaxed fitting forefoot and a sleeveless upper – the windowed design of which appears to be inspired by the Pegasus 31. 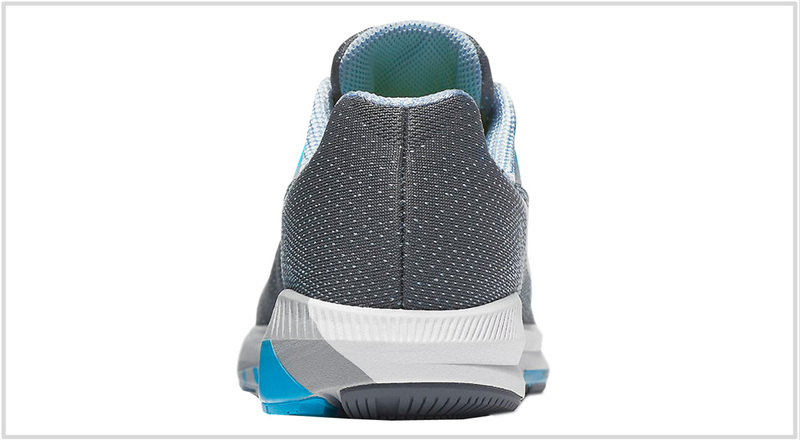 The Span too has a forefoot Zoom Air mated to a Cushlon midsole, so you’re sorted as far as cushioning is concerned.